In 1429 Alexander, Lord of the Isles was imprisoned by James I of Scotland. His territories were granted to Alexander Stewart, Earl of Mar who arrived at Inverlochy Castle in September 1431 to take control. However, he was attacked there by kinsmen of the captive Lord of the Isles and in the engagement that followed, the first Battle of Inverlochy, Royal forces were comprehensively defeated. By the fifteenth century relations between the Scottish Crown and the MacDonalds (whose clan chief held the title Lord of the Isles) were fractious. When James I was released from captivity in England, he sought to break their power. In 1428 he summoned Alexander, Lord of the Isles to come before him at Inverness Castle. When he duly appeared he was arrested and imprisoned. Although released in 1429, Alexander returned to Inverness and burnt the town in retaliation. A Royal expedition forced Alexander to submit to James in August 1429 and he was again imprisoned, this time in Tantallon Castle. With Alexander out of the way, James I hoped to install Alexander Stewart, Earl of Mar into the power vacuum. In early 1431 he was made Lord of Lochaber and a marriage was arranged between Alexander's daughter and Lachlan Maclean forging a link with a significant faction within the Lordship of the Isles. 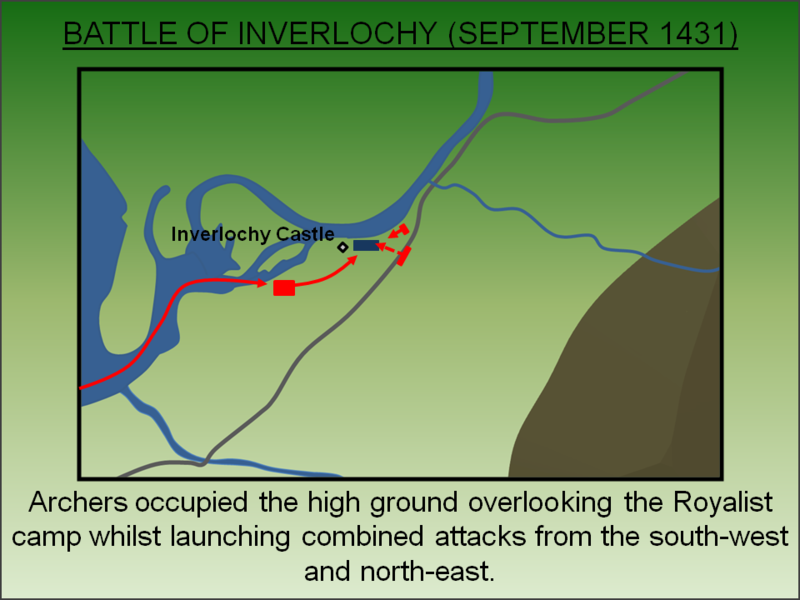 Mar advanced into Lochaber to claim his new inheritance and by September 1431 was in Inverlochy where he had dislodged Alexander's kinsmen, Alasdair Carrach, from the castle. 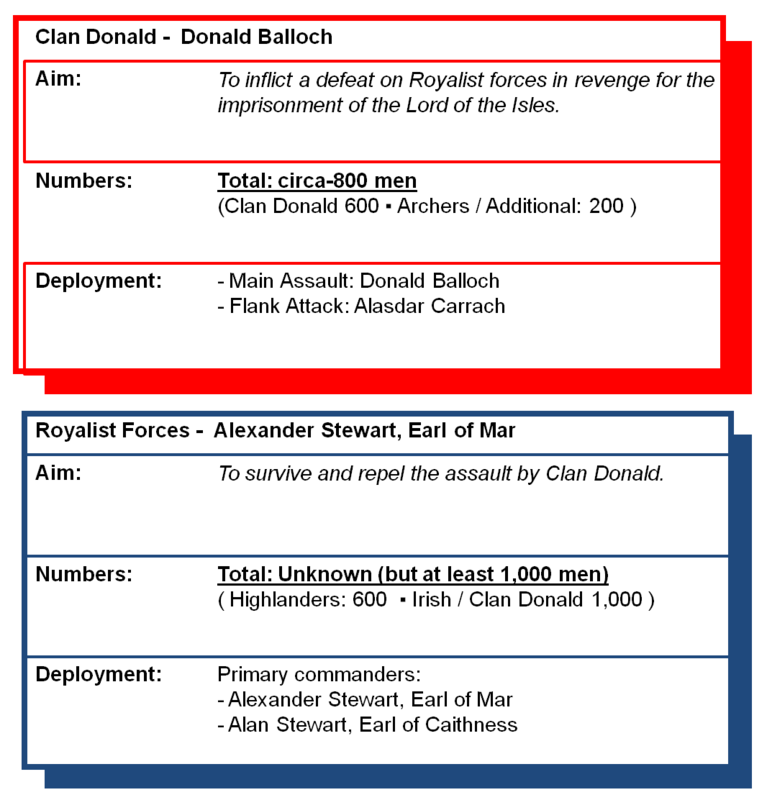 In response Donald Balloch, younger cousin to the imprisoned Alexander, summoned members of his clan to a council of war on the Isle of Carna in Loch Sunart. From there the combined force sailed to Loch Linnhe. The Clan Donald forces consisted of the men who sailed with Donald Balloch and those who had been with Alasdair Carrach when he had been ejected from Inverlochy Castle. The precise location of the battlefield is unknown but it is likely Mar's force was camped on the ground immediately to the north-east of Inverlochy Castle. The MacDonalds sailed along Loch Linnhe and launched a three pronged attack. Alasdair Carrach commanded a detachment of archers who occupied the high ground overlooking the Royalist camp. Concurrently Balloch charged from the south routing Mar's men whilst the remnant of Carrach's men attacked from the other direction. The battle soon descended into a series of skirmishes but the Royalists had lost the initiative and were slaughtered. Some accounts suggest up to 1,000 Royalists were killed in the defeat including Alan Stewart, Earl of Caithness. The Earl of Mar escaped the scene. The Royalist defeat ended James I's attempts to break the Lordship of the Isles. Whilst the King attempted to raise revenue for a new expedition, insufficient funds were generated and ultimately he was forced to reconcile with Alexander. The imprisoned Lord was released and subsequently would become the foremost magnate in northern Scotland. Black, C. S (1936). Scottish Battles. Brown Son & Ferguson, Glasgow. Historical Scotland (2012). Battlefield Inventory: Inverlochy I. Edinburgh. Lancaster, J.H.D (2014). Inverlochy: Battlefield visit notes and observations. CastlesFortsBattles.co.uk. Ordnance Survey, 2015. Fort William. 1:1250. Southampton. Pollard, T. and Oltean, O (2007). Fort William and Inverlochy Archaeological Project (Historic Conflict in the Highlands): Data Structure Report. Glasgow. The precise site of the 1431 battle is uncertain although records suggest it was fought around Inverlochy Castle. The ruins of that structure are substantial and well worth a visit. A nearby cairn marks the site of the 1645 battlefield. The best place to start exploring the battlefield is from Inverlochy Castle. This is sign-posted off the A82 and has a small (free) car park immediately adjacent.